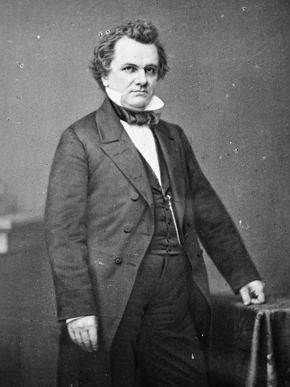 Stephen A. Douglas (1813-1861) was an Illinois lawyer and politician who was the regular Democratic Party nominee in the 1860 presidential election and died shortly after the contest. Advocating for popular sovereignty during the late antebellum period, he served almost 20 years in the U.S. Congress and was an Illinois state representative and supreme court judge. Douglas played a key role in the Compromise of 1850 and drafted the Kansas-Nebraska Act of 1854.